Renewing polyurethane protects hardwood floors and gives them a gloss finish. Additionally, polyurethane does a good job sealing and protecting the hardwood from scratches and spills. In spite of these attractive qualities of polyurethane, the process of applying and removing polyurethane can be difficult. Without professional assistance, you are going to require all the help you can get. Are you planning to apply or remove polyurethane on your own? If the answer is yes, then buckle up your belt because the successful completion of the process requires a lot of patience. You will also need to put in place a few necessary precautionary measures. The level of preparation depends on the size of the floor. Covering a substantial amount of space will require between twenty-four hours before you apply the polyurethane. On the other hand, you will need a few days to enable curing to take place properly. Luckily, there are tips you can follow to apply polyurethane to your hardwood floor﻿ expertly. In the next section, we enlist the best steps to follow to achieve perfect results when applying polyurethane on a hardwood floor. Like all other home improvement exercises, we cannot stress enough the significance of adequate preparation. The hardwood floor has to remain clean the entire time. It should also be completely free of dust. The first step would be preparing the hardwood floor by stripping it of all covering. 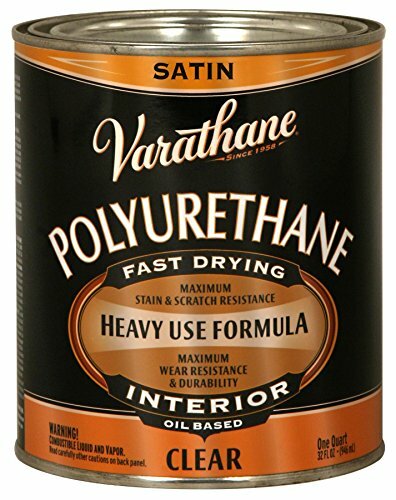 We recommend that you safely remove old coats of polyurethane by following tips for polyurethane removal in the following section. The need to get back to a bare floor may necessitate the need to use an orbital sander. Recently installed floors will only require thorough scuff sanding before the application of polyurethane. In the final step, we highly recommend that you use a vacuum cleaner to remove all the dust. Then follow up with a rag and preferred mineral spirits to finish the preparation process. Polyurethanes produce fumes poisonous to humans, irrespective of whether their main component is oil or water. It is, therefore, prudent to take proper safety measures. Ensure appropriate ventilation aimed at removing toxic fumes is vital. Consequently, all windows should be kept open throughout the process of applying polyurethane to the hardwood floors. An electric fan is quite efficient at removing fumes from a room. Additionally, we recommend that one wears a vapour respirator when handling polyurethane. 1. Ensure you properly stir the polyurethane before transferring some into a paint tray. To thinly and evenly apply polyurethane, use a lamb’s wool paint roller. 2. You should then proceed to apply polyurethane from the furthest corner of the room. Slowly and deliberately move towards the main exit as you apply. 3. Methodically use the roller on the hardwood floor. Ensuring you cover every inch of the floor. Avoid the areas you have already covered. When done, you are advised to wait between four and eight hours. So the coat dries up. 1. Upon drying, the next step involves lightly sanding down the initial coat using 220-grit sandpaper. During sanding, take care that you sand in the same direction as the graining of the wood. 2. Afterward, use a rag and some mineral spirits to remove all traces of dust. 3. The subsequent layer of coat requires mixing polyurethane and mineral spirits in the ratio of ten to one. The aim is to achieve a thinner coat of polyurethane, making it easier for the dissipation of any resultant bubbles. 4. This subsequent coat of applying polyurethane to the hardwood floor should follow the same procedure as the first layer.As was the case with the first layer, the following steps are drying and sanding, and the processes are similar to the first step. After allowing for the recommended drying time, proceed to apply a third coat of diluted polyurethane. However, sanding is not necessary at this stage. Allow at least 24 hours before stepping on the floor and another 72 hours before furnishing. Maintain proper ventilation throughout this duration. Polyurethane is renowned for protecting and giving hardwood floor a gloss finish. Like all coats, however, it ages with time and will need to be removed and replaced with a new one. The next sections deal with the best steps to follow when removing polyurethane from a hardwood floor. Chemical based strippers are the most efficient in removing polyurethane from a hardwood floor. Compared to methylene chloride based strippers, water based strippers come in a wide variety. Because they produce fewer fumes, they are less harmful to humans. However, they are not fast at stripping polyurethane from hardwood floors. To avoid damaging your furniture and rugs, you need to clear the floor of all items and ensure all windows remain open. You can further ventilate the room by using an electric fan. You need to observe all necessary precautions considering the toxicity and acidity of polyurethane stripper. As already stated, opening all windows and using an electric fan is highly advised. Other vital gears are rubber gloves, eye protection goggles, in addition to a vapor respirator. You also consider protecting your skin from splashes by wearing a long-sleeved shirt and long pants. Use a paint brush to apply the stripper all over the floor generously. Allow it few moments to soak. The reaction between the polyurethane and the stripper will soften the coat and lift it off the floor. 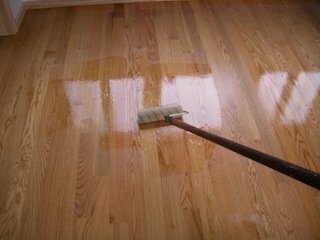 You can use a metal scraper to scrape the polyurethane from the top of the hardwood. A second attempt may be necessary depending on the level of success of the initial attempt. Upon removing the polyurethane, your next step is sanding the whole floor to reveal the origin texture and color of the hardwood. From here the wood is ready for anything. You can stain, seal, or apply a fresh coat of polyurethane to it. Applying and removing polyurethane is a simple DIY exercise. Strictly following the steps of applying and removing the polyurethane can save you pretty sum in expenses. By following these measures, you can use polyurethane to give your hardwood a gloss finish. When polyurethane ages, the removal steps can equally come in handy.